Definition: The meter uses for measuring the current is known as the ammeter. The current is the flow of electrons whose unit is ampere. Hence the instrument which measures the flows of current in ampere is known as ampere meter or ammeter. The ideal ammeter has zero internal resistance. But practically the ammeter has small internal resistance. The measuring range of the ammeter depends on the value of resistance. The capital alphabet A represents the ammeter in the circuit. The ammeter is connected in series with the circuit so that the whole electrons of measurand current passes through the ammeter. The power loss occurs in ammeter because of the measurand current and their internal resistance. The ammeter circuit has low resistance so that the small voltage drop occurs in the circuit. The resistance of the ammeter is kept low because of the two reasons. The whole measurand current passes through the ammeter. The low voltage drop occurs across the ammeter. The classification of the ammeter depends on their design and the type of current flows through the ammeter. The following are the types of an ammeter regarding construction. By the current, the ammeter categorises into two types. 1. PMMC Ammeter – In PMMC instrument the conductor is placed between the pole of the permanent magnet. When the current flows through the coil, it starts deflecting. The deflection of the coil depends on the magnitude of current flows through it. The PMMC ammeter used only for the measurement of the direct current. 2. Moving Coil Ammeter (MI) – The MI ammeter measures both the alternating and direct current. In this type of ammeter, the coil freely moves between the poles of a permanent magnet. When the current passes through the coil, it starts deflecting at a certain angle. The deflection of the coil is proportional to the current passes through the coil. 3. Electro-dynamometer Ammeter – It is used for the measurement of both AC and DC. The accuracy of the instrument is high as compared to the PMMC and MI instrument. The calibration of the instrument is same both for AC and DC, i.e. if DC calibrates the instrument then without re-calibration, it is used for AC measurement. 4. 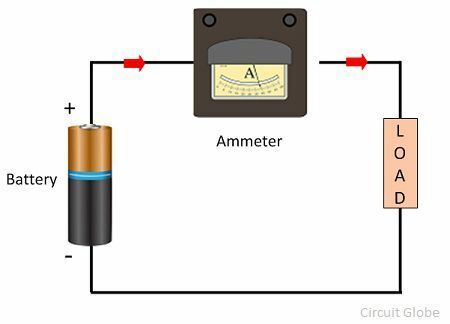 Rectifier Ammeter – It is used for measuring the alternating current. The instruments using the rectifying instrument which converts the direction of current and pass it to the PMMC instrument. Such type of instrument is used for measuring the current in the communication circuit. The high-value current directly passes through the ammeter which damages their internal circuit. For removing this problem, the shunt resistance is connected in parallel with the ammeter. 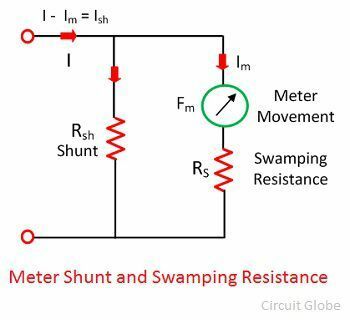 If the large measurand current passes through the circuit, the major portion of the current passes through the shunt resistance. The shunt resistance will not affect the working of the ammeter, i.e., the movement of the coil remains same. The ammeter is a sensitive device which is easily affected by the surrounding temperature. The variation in temperature causes the error in the reading. This can reduce by swamping resistance. 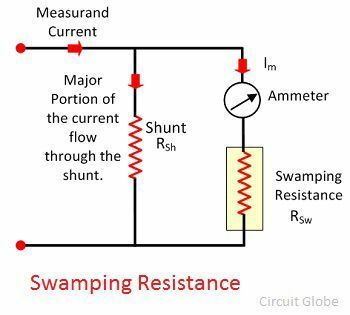 The resistance having zero temperature coefficient is known as the swamping resistance. It connects in series with the ammeter. The swamping resistance reduces the effect of temperature on the meter. The ammeter has the inbuilt fuse which protects the ammeter from the heavy current. If substantial current flows through the ammeter, the fuse will break. The ammeter is not able to measure the current until the new one does not replace the fuse. it was really very very helpful. It was really helpful in my assignment. Really…..